I put together a simple yet very stable, low TC home lab 10K reference just for the heck of it. The centerpiece is a Vishay VHP101 oil filled hermetically sealed 0.005% tolerance part - Y407810K0000V9L. While this is no replacement for a real secondary standard with a linear TC and predictable drift, this will make a nice cost effective reference to use around the shop with more than acceptable performance. The case is a small but heavy duty (thick wall) plastic Hammond box with a copper EMI/RFI inner coating - 1594RBBK. The thought here was to provide a slight amount of thermal stability at the same time as provide a guard path around the resistor. The posts are Pomoa 3770's for the 4W and 3760 for the guard. The only down side with the plastic case is the binding posts can be forced to apply mechanical stress on the leads to the resistor, I tried to add some strain relief on the leads. Most of the time I will be using a shielded 4w lead with spades, so binding post stress should not be a big issue. Z201: 18-28C = 0.8ppm/C. 10-40C = 0.7ppm/C. VHP101: 18-28C = 0.05ppm/C. 10-40C = 0.05ppm/C. The only down side with the plastic case is the binding posts can be forced to apply mechanical stress on the leads to the resistor, I tried to add some strain relief on the leads. Maybe an inner steel plate with flattened holes, like the molds from the Pomona plastic bushings? I actually thought about doing just that, but after it was assembled. That fancy copper lined case probably cost more than the die-cast aluminum ones I use for everything. Nice project. Thanks for showing pictures. One day I'll be able to make charts like that but not yet. $11 from Mouser for the Hammond 1594RBBK box. $61 from Texas Components for the Vishay Y407810K0000V9L resistor. $10 each for the 3770 binding posts and $5 for the 3760.
how about a precision 10K thermister (kelvin sensed) also? btw. what is your measurement setup? A temp sensor here wont yield much benefit with this build. There will likely be more annual shelf life drift than the TC within the normal room temp range (23C +or- 5) and the TC for the VHP101 is not very linear, so computing projected TC error is not very accurate here. Your VHP101 seems to be right in the middle between the binding posts. How did you decide which side to use for sense and which side is force? I have always placed the resistor as close as possible to the force terminals. May be it is not needed. May be even better for mechanical stress to keep the resistor in the middle? I place the resistor in the center as well and always use tick copper conductor. Is 0 PPM really possible? It really does not matter which side is force or sense in my case. So again I followed what seams to be the industry standard and put the Force on the Left. eurofox, no such thing as a 0ppm TC. Also, the best TC specs from Visahy are typical values, not factory tested and guaranteed. You will need to do your own testing to really know what you have. I think I got lucky with my sample. I think that device of Dr. Frank was for TC testing, so high thermal conductivity and low gradient was important. This box is just a reference and not for TC testing use. The enclosure design goals for this project was, remove air drafts, static field and some EMI/RFI protection, and add some additional thermal stability from outside ambient influences (such as the A/C coming on or the shop door opening with a cool air draft). This is why I chose the copper lined plastic enclosure over aluminum. Also, this gives me a true guard path around the resistor. It seems to work well, its not sensitive at all to handling the enclosure while measuring, but if you put your hands near the unshielded test leads you will see the static charge influence. For TC testing, I have a new thermal box I'm building on my bench now. 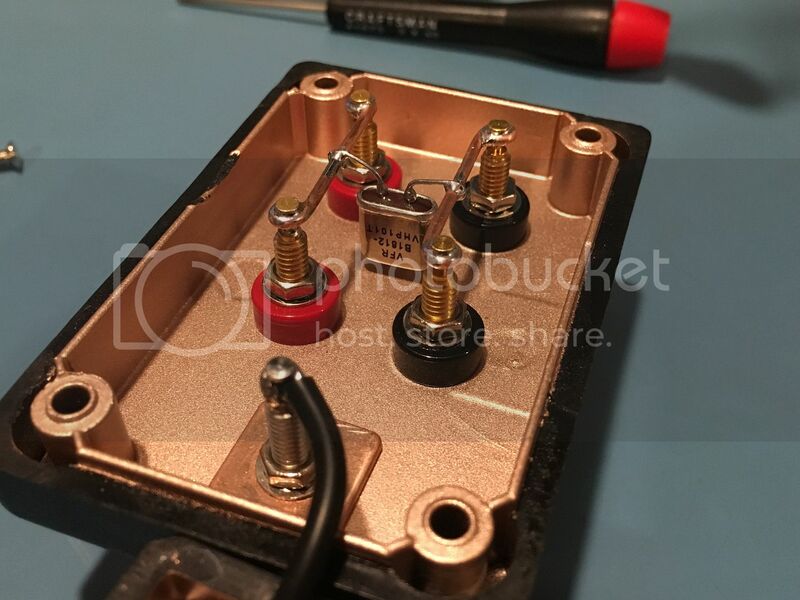 That WILL have a 4 wire PT100 and other sensors, its a heavy thick wall aluminum box with uniform heating elements, but this will be saved for a separate thread. 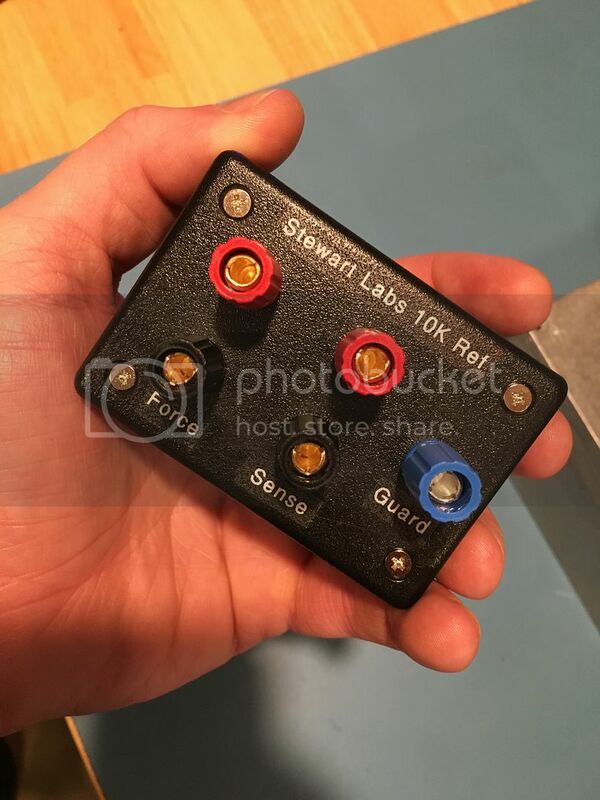 "For TC testing, I have a new thermal box I'm building on my bench now. 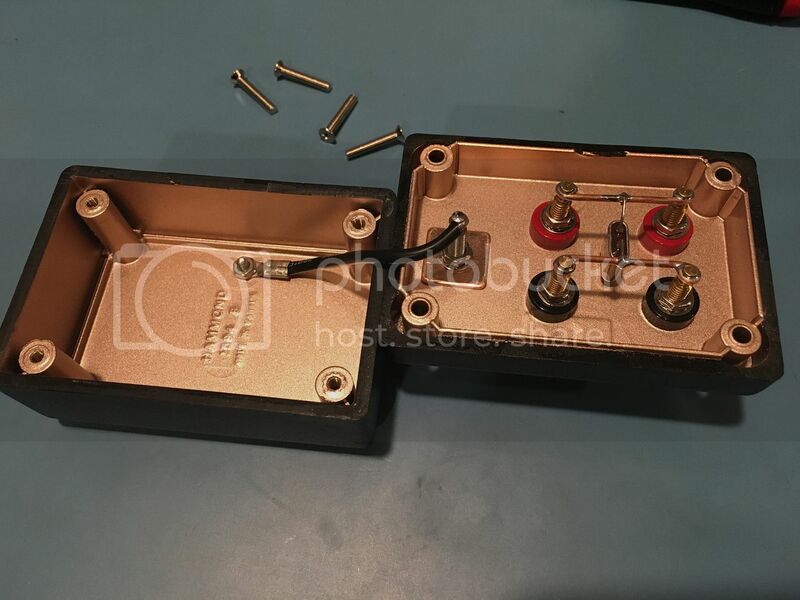 That WILL have a 4 wire PT100 and other sensors, its a heavy thick wall aluminum box with uniform heating elements, but this will be saved for a separate thread. " I for one can't wait for that report. I made a copy using a Vishay 0TC part - much appreciate the idea! Mine's in a metal box with a thermistor. I used the 0.0% TC unit from Digi-Key. Posting this now requires you to post up a photo . Well , my design is indeed intended as a secondary resistor standard, not only for T.C. testing, and temperature balancing and measurement is strictly required for any reference resistors, see esi SR104 box. Due to 4 wire Kelvin connection, location of soldering does not play a role. You also should have avoided heating the VHP resistor during soldering, so these thick copper wires are no good. - missing aluminium or copper block, assembled to case - your setup creates further temperature imbalances between case and resistance element. - missing thermometer to precisely determine T.C. in first place, and in use would give the opportunity to precisely determine its R(T), again see esi SR104. The oil filled hermetically sealed Vishay resistors are extremely stable over time, the specification is < 2ppm / 6 years for shelf life, which seems to be correct from my long term monitoring of five VHP202Z. So it's really a pity that you regard this resistor as being shabby. All good points Dr. Frank. Ill keep these in mind for v2. I build one using the same resistor but mount it in an aluminium box, use wires with similar diameter of the resistor wires, use the full length of the resistor wires and put clip on the wires to bypass the heat during soldering. Can I buy similar resistors on Ebay? Can I use some wirewound resistors from old resistance decade? You can buy it from Mouser, they ship free of charge above 50€ to Europe in just 2-3 days and since this resistor cost almost 50€ you just need to ad some small parts.